Tooth movement is natural, and whether you had orthodontic treatment as a child or not, you may find as an adult your teeth are not as straight as you would like them. A misaligned smile can affect both confidence and comfort, but the thought of tolerating an unsightly and uncomfortable brace for several months is enough to put a lot of adults off having anything done about it. Thankfully, the old ‘train track’ braces are not the only option anymore. Today you have the option to solve the problems of crooked teeth with a much less invasive and much quicker manner, thanks to the Inman aligner. The Inman aligner is an orthodontic treatment which has been developed to straighten out your visible teeth in a quick, gentle manner. It is known in some circles as the ’12 week wonder brace’, thanks to the highly efficient and effective results that have been seen by patients. It is available as a standalone treatment for straighter front teeth or as a precursor to further cosmetic treatment such as bonding or veneers. Having your teeth straightened before veneers will allow your dentist to use paper thin veneers for a flawless, luminous finish. 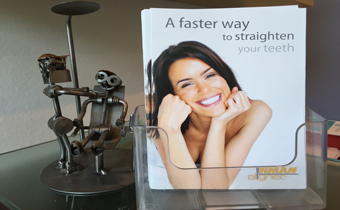 The Inman aligner is a retainer type appliance, made from titanium springs which push on the aligner bows. The treatment works by using the constant force of these springs to gently push the teeth back to their desired position and, once in place, to work as a retainer to keep them in place. The aligner appliance is easy to remove and replace, meaning it can be taken out for eating and teeth cleaning. Unlike traditional braces, there will be no lengthy orthodontic appointments to twist and tighten wires or adjust the appliance; in fact all that is required is a 15 minute check up every month to make sure it is working as desired. What should I expect from my treatment? The ’12 week wonder brace’ certainly lives up to its name, and 12 weeks is about the average length of time most patients need to achieve their desired results. Depending on the treatment required, your teeth can be straightened in anything from 6 to 16 weeks, making this the most rapid form of teeth straightening available. This simple yet effective treatment is ideal for minor misalignment but may not be suitable for those with more severely misaligned teeth. The treatment itself is painless, although minor discomfort is occasionally reported during the first few days. The treatment affects only the front teeth, so if you have back teeth that require treatment then another option may be better for you. Who can have the Inman aligner?